Last month I started a discussion of four quarter varieties that were considered too rare to include in the Top 25 set: the 1854 thin date, the 1856 Flag of 5 in the Shield, the 1857-O with the top of “18” in the denticles, and the 1858-S mintmark far left. 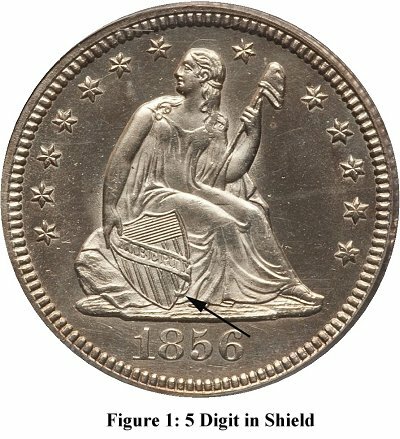 This month we revisit the 1856 Flag of 5 in Shield, which has been mentioned in this column a couple of times before, and is the second of the four coins left off the Top 25 list due to its rarity. A total of 7 examples of the variety were reported in the 2007 LSCC survey, with two more confirmed since. Given the high mintage of the 1856 it seems likely that additional examples will be found, but for the time being it is very rare and excessively difficult to locate. The finest known, and only mint state, example sold for $1725 on June 6, 2010. It resides in a PCGS holder graded MS63. The variety was discovered by Bill Bugert and initially reported in issue 52 of the Gobrecht Journal in November of 1991. The note and photograph are reprinted on page 382 of Gobrecht Journal Collective Volume 4. The variety is listed in The Comprehensive Encyclopedia of United States Liberty Seated Quarters (9-G), but without detailed information. In fact, only a single example, presumably the discovery coin, appeared in the 1993 LSCC quarter survey.